Home » Best Sellers » Give em the Pickle! Home → Shop → Best Sellers → Give em the Pickle! This customer service program is loaded with humour, touching stories, fun graphics, and great music that all work together to deliver the powerful message: "take care of your customers". 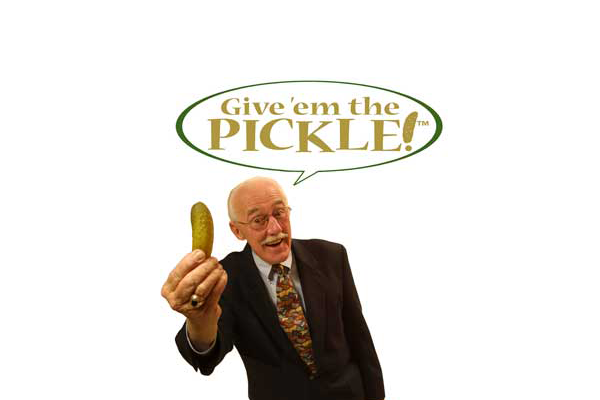 Bring the enthusiasm and wisdom of Bob Farrell to your next meeting and transform your team into a bunch of pickle-givers! Your business is not what you sell, it’s who you serve. Meet Bob Farrell, founder of Farrell’s Ice Cream Parlor and Restaurant, as he serves up the most important aspect of any service business…taking care of the customer. We’re all in the same business, the people business. Our job is to make customers happy. What’s the best way to do that? By giving out pickles. Pickles are those special or extra things you do to make people happy. The trick is figuring out what your customers want and then making sure they get it. That’s the pickle. Make sure your employees have the scoop on effective customer service with this fun, lighthearted and highly effective training tool. Viewers will learn what it takes to foster and maintain customer loyalty. Service – Make serving others your #1 priority. You work in a noble profession, be proud of what you do. Attitude – Choose your attitude. How you think about your customers is how you will treat them. Consistency – Set high standards, and stick to them. Customers return because they liked what happened last time. Teamwork – Look for ways to make each other look good. In the end, everything ends up in front of the customer! Service – Make serving others your #1 priority. Attitude – Choose your attitude. Teamwork – Look for ways to make each other look good.